Since the 1980s, studies have shown that clinicians frequently raise questions during patient encounters in all healthcare settings. These studies have suggested that although questions arise frequently, they often go unanswered. “Unanswered questions should be seen as an opportunity to improve outcomes by filling gaps in medical knowledge,” says Guilherme Del Fiol, MD, PhD. He adds that understanding clinicians’ questions is essential to guiding the design of interventions that aim to provide the right information at the right time. According to Dr. Del Fiol, there are challenges associated with maintaining current knowledge in medicine. “Several factors can come into play,” he says. “Science is continuing to expand medical knowledge, but this can make it increasingly complex to appropriately deliver healthcare. In addition, the aging population continues to grow, a phenomenon that further complicates how easily clinicians can address more difficult questions at the point of care.” No systematic reviews have been available on the clinical questions raised by clinicians in the context of patient care and decision making. Dr. Del Fiol and colleagues recently conducted a systematic review of the literature on clinicians’ questions. Published in JAMA Internal Medicine, the research focused on the need for general medical knowledge that could be obtained from books, journals, specialists, and online resources. The systematic review took into account the frequency by which clinicians raised clinical questions, how often these questions were pursued and how often answers were successfully found, and the types of questions that were typically asked. They also sought to determine overriding themes and the potential effects of information seeking on clinicians’ decision making. 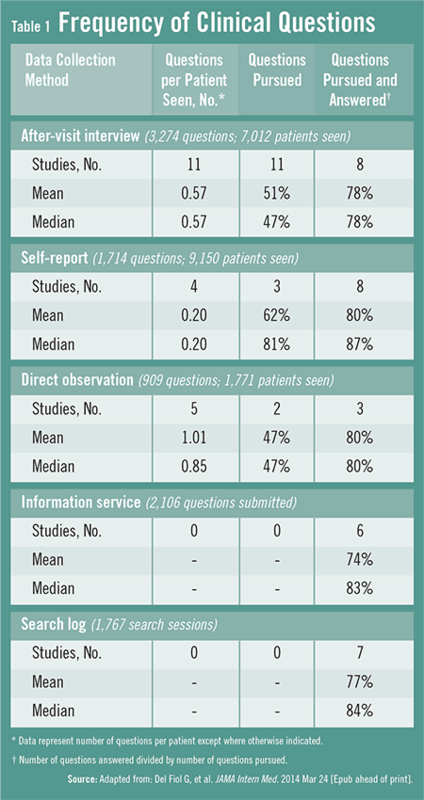 For the analysis, Dr. Del Fiol and colleagues reviewed studies that examined questions raised and observed by clinicians in the context of patient care. Of the more than 21,000 citations that were considered, 72 met the study group’s selection criteria. The average frequency of questions raised was 0.57 per patient seen, but clinicians pursued just 51% of these questions (Table 1). However, clinicians who pursued these questions found answers to them 78% of the time. Overall, 34% of questions concerned drug treatment, and 24% concerned potential causes of symptoms, physical findings, or diagnostic test findings. “Our results were fairly stable over time despite the broad availability of online evidence resources that can answer questions,” says Dr. Del Fiol. 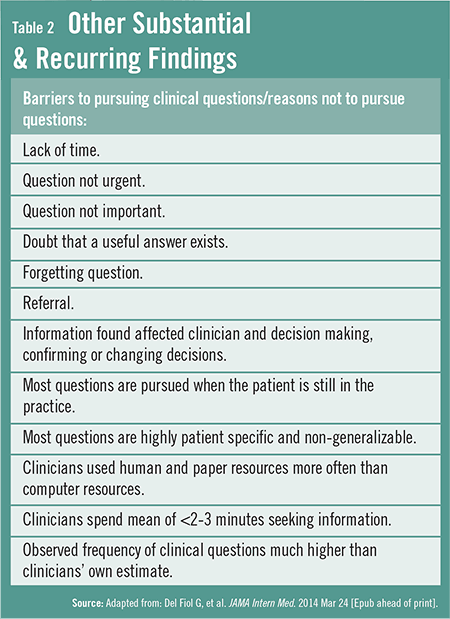 “Unanswered questions are missed opportunities for timely learning and practice improvement.” In addition, Dr. Del Fiol notes that clinicians’ lack of time and doubt that a useful answer exists were the main barriers to information seeking (Table 2). Del Fiol G, Workman TE, Gorman PN. Clinical questions raised by clinicians at the point of care: a systematic review. JAMA Intern Med. 2014 Mar 24 [Epub ahead of print]. Available at: http://archinte.jamanetwork.com/article.aspx?articleid=1846630. Davidoff F, Miglus J. Delivering clinical evidence where it’s needed: building an information system worthy of the profession. JAMA. 2011;305:1906-1907. Ely JW, Osheroff JA, Chambliss ML, Ebell MH, Rosenbaum ME. Answering physicians’ clinical questions: obstacles and potential solutions. J Am Med Inform Assoc. 2005;12:217-224. González-González AI, Dawes M, Sánchez-Mateos J, et al. Information needs and information-seeking behavior of primary care physicians. Ann Fam Med. 2007;5:345-352. Ely JW, Burch RJ, Vinson DC. The information needs of family physicians: case-specific clinical questions. J Fam Pract. 1992;35:265-269. Del Fiol G, Haug PJ, Cimino JJ, Narus SP, Norlin C, Mitchell JA. Effectiveness of topic-specific infobuttons: a randomized controlled trial. J Am Med Inform Assoc. 2008;15:752-759. Ely JW, Osheroff JA, Gorman PN, et al. A taxonomy of generic clinical questions: classification study. BMJ. 2000;321:429-432. Schaafsma F, Hulshof C, de Boer A, Hackmann R, Roest N, van Dijk F. Occupational physicians: what are their questions in daily practice? An observation study. Occup Med (Lond). 2006;56:191-198. Del Fiol G, Huser V, Strasberg HR, Maviglia SM, Curtis C, Cimino JJ. Implementations of the HL7 Context-Aware Knowledge Retrieval (“Infobutton”) Standard: challenges, strengths, limitations, and uptake. J Biomed Inform. 2012;45:726-735. Guilherme Del Fiol, MD, PhD, has indicated to Physician’s Weekly that he has worked as a paid speaker for Health Level Seven International and has received grants/research aid from the AHRQ (grant K01HS01352).